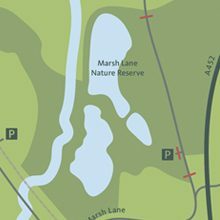 Marsh Lane Nature Reserve at Berkswell (between Solihull and Coventry) lies adjacent to and in the flood plain of the River Blythe, a Site of Special Scientific Interest. It opened to permit holders on the 1st of July 2001. RMC Aggregates Western, originally part of the RMC Group and now CEMEX, started the extraction of sand and gravel from approximately 75 acres in 1995 and the gravel extraction was completed in 1999. Since conclusion of the quarrying, the land was reinstated jointly by RMC Aggregates Western and the owners, Packington Estates. It now consists of three main pools (one of which is a reedbed) together with woodland, grassland, ponds and some agricultural land. Two of the main pools have been shaped and include a number of islands which, since formation, have attracted a wide range of breeding and passage waders. Four hides have been constructed which, between them, give excellent views of all the pools and islands. The hides are linked by hard paths and there is a car park within the site’s locked gates. Disabled visitors should find the site suitable for them although the paths are unbound. The paths are made of planings and are reasonably compact but wheelchair visitors may need some aid. Within the hides, seats can be unhinged or moved to allow wheelchair access to the blinds. Up to May 2018, the site list stood at 203. 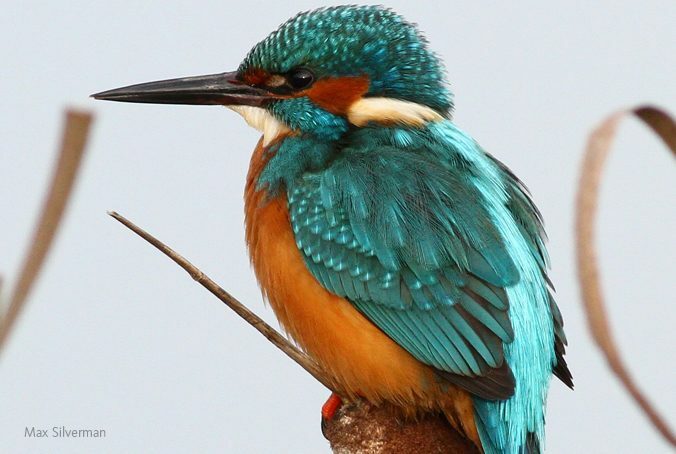 Birds of particular note in this time include Bonaparte’s Gull, Hoopoe, Spotted Sandpiper, Grey Phalarope, Black Kite, Rough-legged Buzzard, Spoonbill, Stone Curlew, Lesser Yellowlegs, Dusky Warbler and Beeater. Little Egrets occur regularly, and Osprey is recorded in most years. Buzzards are daily visitors, Hobby is regular in the late summer and early autumn, Marsh Harriers are seen most years and Hen Harriers less regularly. Most passage waders have occurred including Avocet, Knot, Spotted Redshank, Turnstone and Temminck’s Stint. Up to three Black-necked Grebes were recorded in the spring of 2000 and again in 2012 and 2014. In winter, up to 400 Wigeon and 750 Lapwing are regularly present. There are two established feeding stations which attract a variety of species including Nuthatch and Great Spotted Woodpecker. Bramblings have visited regularly over previous winters. A 5 acre field has been set aside to provide food and cover for finches and buntings in Winter with flocks of over 100 Yellowhammers and 60 Reed Buntings and up to 300 Linnets. In May 2010, with help from Natural England, an area of some 16 acres of former arable ground was shaped into wet grassland with scrapes, suitable for breeding and feeding habitat for waders. Two hides have been constructed overlooking the field, linked by a series of paths through the 13 acre Siden Hill Wood. 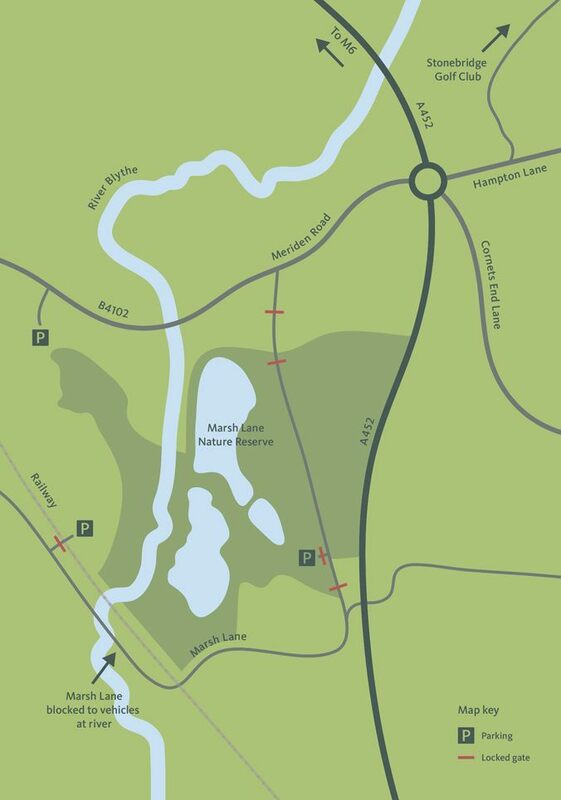 Small car parks are located at either end of this walk, which lies west of the River Blythe and can be reached, on foot, from the main Reserve. There is a good network of footpaths linking the site with other attractive areas of countryside, including Bradnocks Marsh. For new site plan, see download box above.